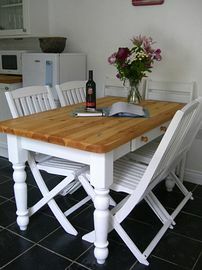 Poppy Cottage is situated in the beautiful and unspoiled seaside village of St. Agnes. This charming three bedroomed cottage has been lovingly renovated whilst retaining many of its original and romantic features. 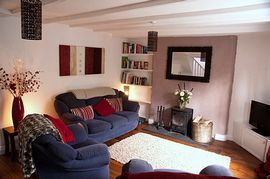 Includes wood floors, a beamed ceiling and open fire, ideal for curling up around with a good book and glass of wine! On a summers day relax in the garden, where you will find furniture and a barbecue, great for a celebration. The Cottange has 3 double bedrooms, an upstairs bathroom, a kitchen diner, an open-plan lounge, spacious lawned garden and a sun terrace, making it the ideal choice for family or couples accommodation. 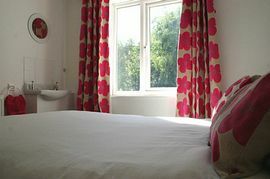 All the rooms are surprisingly sunny and light for a cornish cottage and all are fully furnished, to make for a very comfortable stay, a real home from home. St Agnes boasts a variety of leisure activities to entertain you. The area is famous for its tin mining history and you can learn more about this fascinating past at the St. Agnes Museum, Blue Hills Tin Streams and Wheal Coates. If you enjoy shopping there are numerous art and craft shops as well as galleries. A convenience store, wine bar and pub are all within a couple of minutes walk. For the sports enthusiasts there are also two great surfing beaches nearby. The nearest beach, Trevaunance, is only a 10 minute walk away. This beach is very popular with families, it has numerous caves to explore and there is a fishing point. Food is available at the beach also beach huts for hire. The very sunny sun terrace. As the night draws in, we light the woodburning stove. 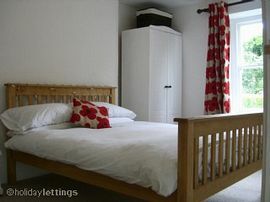 All bed linen provided and included in price, towel hire is also available. There is a small front garden with seating (perfect to watch the world go by) and a large enclosed and private rear garden with patio terrace, garden furniture and BBQ. By Rail: The nearest train station is TRURO (10km) A taxi would cost roughly £20 and are always available but a bus from Truro is also available and frequent. By Air:Newquay airport is about 30 mins drive (20 km) away flights are a quick and easy way to reach the west country. Great deals are available from Air Southwest. Direct flights available from Stansted, London City, Gatwick. Edinburgh, Leeds/Bradford, Birmingham and Dublin. Car hire is available from both Truro station and Newquay airport. 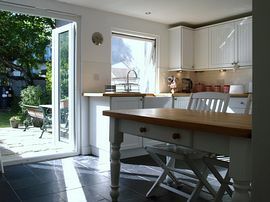 Poppy cottage is available all year round as a holiday rental from 9th April 2011. Changeover days are usually always Saturdays, but short breaks and longer stays can be negotiated.